The Role of the "Ovarian Follicle"
Each egg cell (oocyte) that you are born with is surrounded by an ovarian follicle inside of your ovaries within the human reproductive system. They lie dormant inside these follicles until ovulated. You (females) are born with a finite (set number) of egg cells. This is usually about 1 to 2 million. You do not produce any more after birth. Actually, the opposite occurs. They will degenerate over time leaving about 400,000 at puberty. At the beginning of each ovulation cycle, during the follicular phase, about 1000 ovarian follicles are recruited and begin to grow under the influence of the hormone FSH (follicle stimulating hormone). As these primary follicles continue to mature, (to secondary and tertiary stages) they start to produce estrogen. Once estrogen reaches a certain level FSH levels will begin to fall signaling the end of the recruitment process. Then the selection process begins. During this time, many follicles (and therefor your eggs) will degenerate through a process called atresia. This is often referred to as a race between the the eggs. This ensures that only the healthiest eggs are produced at ovulation as less healthy ones will die off. Once estrogen has reached its peak, LH (luteinizing hormone) will surge and peak and signal the remaining dominant follicle, to burst and produce the egg or ovum. 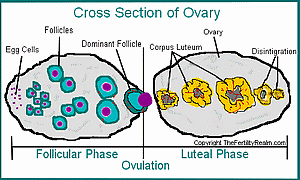 After ovulation, the dominant ovarian follicle while still under the influence of LH, the empty follicle changes to become the corpus luteum during the luteal phase of your cycle. 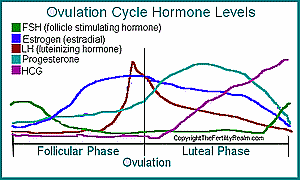 Once ovulation occurs, it is the end of the follicular phase of your ovulation cycle and the luteal phase begins.